When I was younger I used to get confused why a magazine my mum bought would have their own selection tin of biscuits on the market. 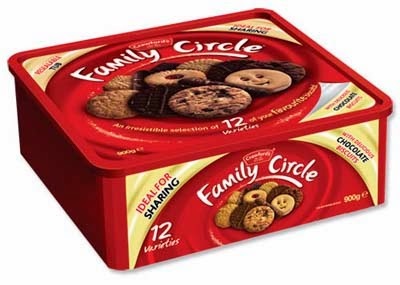 Family Circle the read and the Family Circle biccies had nothing to do with one another I realised as I got older. But, I digress, who remembers the tin of biscuits full of favourites such as Funny Faces, Pink Wafers and the perennials – Custard Creams and Bourbon Biscuits? Although, as I remember it, the ones in that tin never tasted quite as good as the ones available in individual packs. Custard Creams and Bourbon Biscuits scream Britishness and I wondered what I could conjure up in the Cakeyboi kitchen with them. Then I remembered my Jaffa Cake Truffles. Those other favourites of the biscuit tin (but are they a biscuit or a cake?) made lovely individual bites. So why not use custard creams and bourbon biscuits in the same way? I whizzed them up in my Optimum 9400 and blended each biscuit crumb with cream cheese. 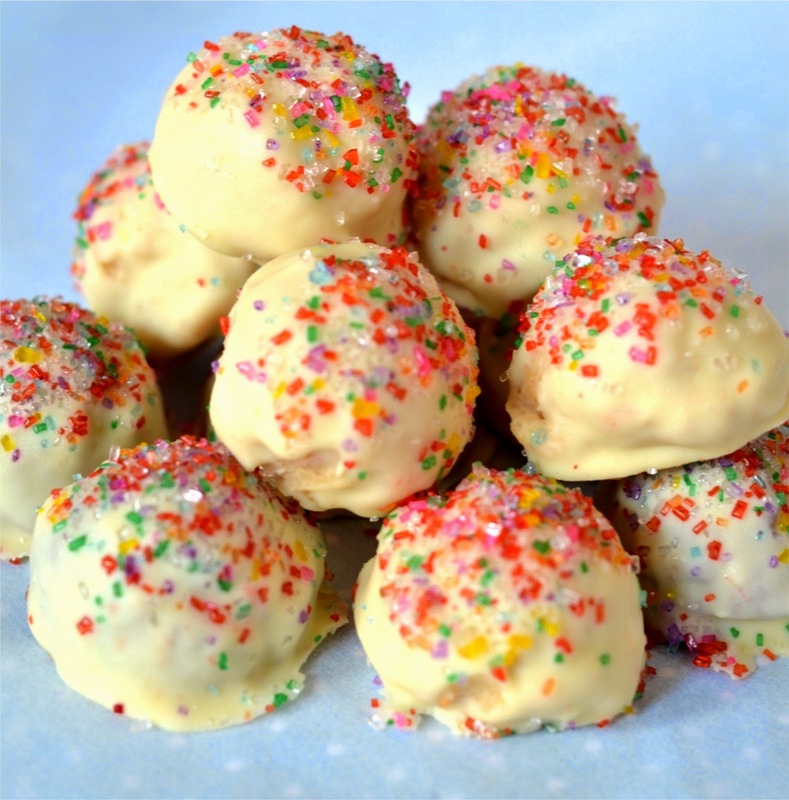 I formed them into little balls, chilled them and then coated them in white chocolate, with a wee sprinkle of sprinkles for garnish. When set, they tasted delicious. The flavour of each biscuit really came through and the delicious crack of white chocolate made them even more special. Why not give these a try for your next soiree? But remember - don't try and dunk them in your tea!! Little balls of biscuit deliciousness - just don't try dunking them in your tea! In a blender, whizz the custard creams up to a fine crumb. Place in a bowl and stir in 250 grams of the cream cheese until the ingredients form a solid 'dough'. Take tablespoons worth of the mix and roll into balls with clean hands. Place on a baking tray lined with greaseproof paper. Repeat the process with the bourbon biscuits. Place in the fridge to chill, about 1 hour. Melt the white chocolate in a microwave or bain-marie. Coat the chilled balls in white chocolate and transfer back to the greaseproof paper. Sprinkle on the sprinkles whilst the chocolate is still molten. Place the truffles back in the fridge to set, about another hour. Oh I love these! What a brilliant idea Stuart. We've never had those boxes of biscuits in our house but custard creams used to be a regular in the shopping trolley because they were a favourite of a dog we had years ago. I was rather partial to them too! All the tastes of my childhood rolled into one. Thanks for this trip down Memory Lane. They look amazing Stuart. The coloured sugar crystals really set them off. They are from TK Maxx Luca, get a lot of my baking supplies there. That is inspired Stuart and they look amazing. I'll definitely be trying these! I love a truffle and I love a biscuit (or two) so these sound great to me. 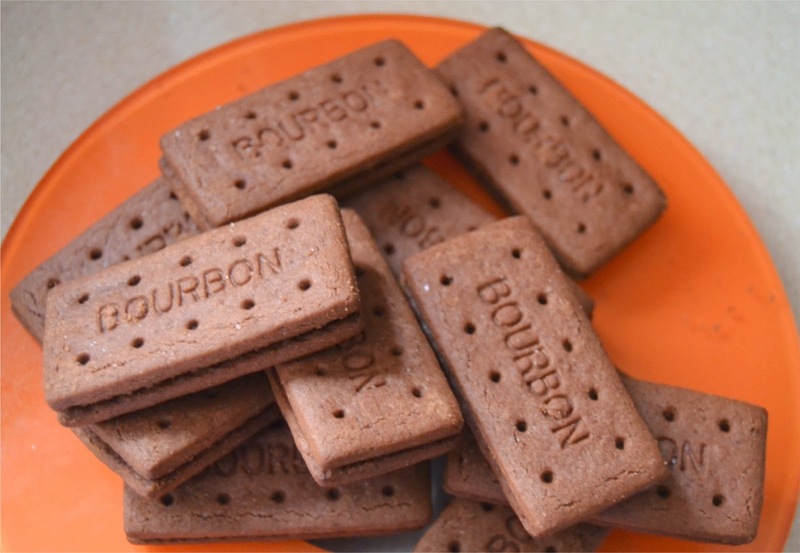 I remember that bourbons never seemed as good in the mixed tins for some reason. I always imagined that we were being punished for being unfaithful and trying other types of biscuit while the true bourbons were reserved for the faithful who would buy nothing else. I always thought they were slightly smaller too, although that could be just in my strange mind. We must both have strange minds then Phil lol!! Paul (the husband) would love these! Thanks for sharing. Absolutely great idea! Really clever use of the blender again and I bet the bisuit truffles are a great nostalgic taste! Yep, takes you right back to those tins of biscuits, only better!! Genius idea! Also reminds me that I've not made cake or biscuit truffles for a long time. Oreo truffles are my favourite but now I want to eat some of these! Oreo ones are so good too! Oh my goodness these sound fantastic! I would quite possibly sit there and eat the entire batch in one go though! Yum! Thanks for linking up to my own no-bake recipe :) I also had no idea that the FC magazine and FC biscuits weren't related! Our local newspaper used to have a Family Circle comic in it I loved. Thanks for the link Elizabeth! I'd forgotten that but yes, you are right, the biscuits from the tins were always disappointing compared to the packets. Your truffles look fantastic - a sophisticated way to give your friends a trip down memory lane! Genius! Cheers Vohn - glad it's not just me that used to be disappointed! This sounds amazing! I'd never thought making truffles could be this easy and the bourbons make it so nostalgic and fun. Thanks Hannah - yep, very easy! I know, small minds and all that lol! I love quick easy desserts like this one. I love these! Custard creams and bourbons are ever present in our biscuit tin as they are an excellent form of bribery for Izzy but I think the next packet is going to be destined for these!